Popscene Live is continuing to do its bit for live music in Bangkok. This time around we're lucky enough to have a top band all the way from Kulala Lumpur, Malaysia. 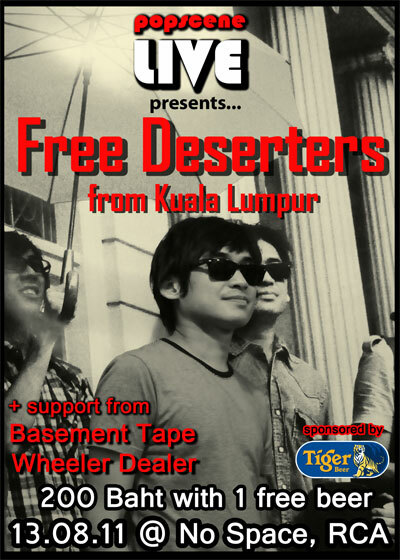 Ladies and Gentleman, may we introduce... Free Deserters. They've supported Gruff Rhys, We Are Scientists and Ken Stringfellow on their recent world tours, launched Club KOKO in KL, played the Lock Stock festival in London, Baybeats in Singapore, released EP 'Last Chance' and album 'Free Deserters' and now they are landing in Bangkok.